Does the TV2 have an audible internal alarm? The TV2 does have an internal alarm. Anytime an alarm is triggers the monitor will ‘beep’ and the screen will display the alarm conditions. It is also equipped with a N/O (normally open) dry-contact relay that can trigger an external alarm, a buzzer, a bell, a light, an auto dialer, or other warning device. Since the relay is a dry-contact relay there is no power supplied when it closes, however an external alarm or light which has it’s own power supply can be wired through the relay so it will activate when an alarm occurs. The relay’s ‘trigger conditions’ are set for each sensor on its alarm menu. The alarm must be ‘enabled’ for it to work properly. Each sensor has a high and a low set-point with delays. Setting the delay properly will eliminate false alarms. More information can be found on how the alarm works in the ‘Alarm Behavior’ note. Once an alarm is triggered the internal speaker will beep. The speaker can be silenced by pressing the ‘Esc’ key. In addition, if the TV2, is auto downloading to a computer either through the USB cable or the Wired Ethernet port a text or email message can be sent when an alarm occurs. The cable between the TV2 and an auto dialer can be any length needed. It is simply a two conductor cable between the relay on the TV2 and the RJ11 connector which plugs into the auto dialer. Several TV2 devices can even share the wire, by wiring them in a star configuration. The relay is fused at 30vdc and 0.5amps. Many of Two Dimensional Instrument’s customers use an auto dialer to call their cell phone if an alarm is triggered’. We offer an several different auto dialers that will dial multiple different numbers (i.e. phone, pager, cell) and leave a message when triggered, although any auto dialer that can be triggered with a dry contact relay will work equally well. Can I print out a paper chart of my logged data? The TV2 logs a lot of data, which can be backed up or copied to a computer at any time with the free PC software (TView) supplied by 2di. A regular schedule for downloading data should be established so that on a periodic basis, say – once a month or every six months, data is uploaded to a computer for archiving, if the TView software is not set to automatically copy the data to your computer. The TV2 can be unplugged from the wall power adapter and the power cord and the USB cable plugged into a USB port on any computer. If the TV2 is plugged into a computer with the USB cable the TV2 will be powered by the computer. Once your data is downloaded to a PC with the TView program you can print a copy of your chart. We recommend that you always print your chars to a color printer since the multiple lines that might be present from multiple sensors will be hard to distinguish is you print them all in black. A picture of a PDF of a chart that has been downloaded and printed. How do I download data to a computer for archiving or printing? In order to download data from the TV2 it must be able to communicate to a computer via a USB port of a computer or over your Local Area Network. A USB cable is supplied with your TV2 which is normally connected to your TV2’s power adapter plugged in the wall. This cable, or any USB cable, can be plugged into a USB port on your computer, in which case the computer will supply power to the TV2. Once this cable is plugged into the computer you will need to link it to the computer. Clicking Managing TV2s in the TView program will allow you to select a USB port or IP address of the TV2. Data can then be downloaded to the PC. The TV2 has a wired Ethernet Cable connector you can plug into your local area network. The TV2 Network Menu, on the TV2, allows you to set a static IP address or tell the TV2 to use the DHCP function of a router on your network. 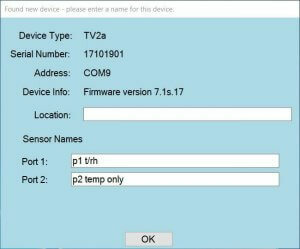 In either event you must enter the IP address into the Manage TV2s menu in the TView program so that TView can find it and allow you to name it. If you would like to make your TV2 accessible from outside your local area network you must use the port forwarding feature of your modem. Since each modem is different you will need to consult the documentation for your modem to accomplish this. At the very least you will need to know the IP address of the TV2 so you can enter it into the port forwarding area of your modem. Once that is set properly you will be able to see the opening screen of the TV2 by typing in the IP address in the address area of any browser. How accurate are the various sensors that can be used with the TV2? The accuracy of the TV2 depends on the sensor being used, since there is negligible instrument error (less than .1%) introduced by the TV2 itself. The TV2 can be used with several different types of sensors; digital, thermistor, thermistor and RH, differential pressure and several different types of thermocouples. The thermistor sensor, whether wired or wireless, has an accuracy of ±0.3°C or ±0.2°C. 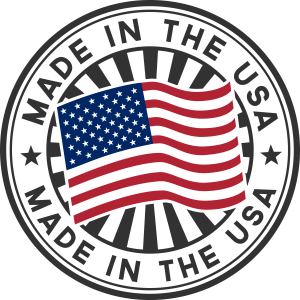 These sensors can be calibrated and a certificate traceable to NIST provided before shipment for an additional charge. This sensor uses the same thermistor sensor as listed above with the addition of an RH sensors The RH sensor used is made by Honeywell and has a stated accuracy of ±1.5% with a range of 0% RH to 99% RH at 25°C, non-condensing. Our thermocouple sensors have the accuracy defined by the type of thermocouple supplied. We normally supply a T-type thermocouple which is accuracy to ±1.0°C. Other types of thermocouples have different levels of accuracy. A K-Type thermocouple for example, has limits of error typically ±2.2°C or 0.75% above 0°C and ±2.3 °C or 2.0% Below 0°C, but will vary depending on the thermocouple. Most types of thermocouples do have very good repeatability which means that measured temperatures are the same even if the instrument itself is off by 1°C. We offer a wired digital sensor which has an accuracy of ±0.3°C through its range. Our differential pressure sensors have an accuracy of ±0.007 wc” or ±0.002wc” with a range of ±1.0wc”. Additional sensors with wider ranges are available. Can I calibrate the sensors? Each TV2 sensor type can be calibrated in the field. TV2 sensors are calibrated by comparing the measured temperature against an instument which has been verified to be accurate, ideally one which has its calibration traceable to NIST and has a stated accuracy at least twice that of the sensor you are calibrating. All wired TV2 sensors have a three point characterization table built into the sensor itself which can be accessed through the TV2 menu system. This makes it possible to move a wired sensor from one TV2 monitor to a different one without losing the calibration data. A TV2 wireless sensor can be calibrated but any offset values entered are stored in the TV2 monitor itself and not on the sensor. So if a calibrated wireless sensor is moved from one TV2 monitor to a different one, a new calibration should be done or, at the very least, any offset values should be entered into the new TV2. If it is necessary to enter an offset value into a wired sensor, it can be done with the menu system. Values entered for a wired sensor are stored on the sensor rather than on the display unit, so that sensors moved to a different display unit carry their characterization values with them. More information about calibrations and the procedures used for calibration can be found here. 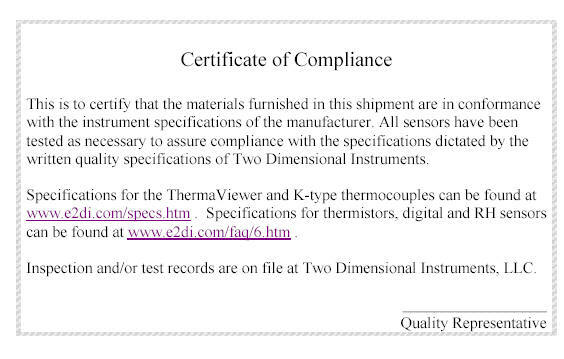 A NIST traceable calibration is available from 2di for an additional fee. Calibration frequency is normally determined by the user to comply with certification requirements. Data Security and 21 CFR part 11? The TV2 is fully 21CFR11 compliant. Each temperature sample is logged in FRAM. This is a type of memory that will never lose its value even if power is removed. Also logged data can not be altered in any way by the user. It can be erased but not changed. The time and temperature display parameters can be changed if the user has the proper password, but the underlying data can not be altered. It is stored in FRAM so even if power is lost the data is protected. You can literally turn the TV2 off, run the battery all the way down, walk away and come back 2 years later and your data will still be there. When the collected data is downloaded to a computer the TView program displays it as a chart. Charts from multiple TV2s can be combined. Data from one sensor can be moved to the chart of another sensor or deleted from a chart or data from all sensors from one or more TV2 monitors can be seen on one chart. Charts can also be printed out. The key point is that the data can only be seen and moved around. It can not be edited in any way. Even when the data is saved on the local computer it can not be edited. The file could be opened but it will appear as nonsense data. The data is encrypted when it is stored. This ensures that the data is unaltered from the moment it is logged, thus compiling with 21CFR11 standards. There is a way to edit the data but this violates the 21CFR11 rules. The charts can be exported to an XLS file which can be viewed with Excel. So if you do not care to maintain secure data you can load a previously saved ‘txv’ file onto your computer and export it. Any time a file with a TXV suffix is loaded into the TView program a small icon appears on the screen indicating that you are viewing encrypted data. If exported data is loaded into Excel, Word, Notepad or some other text editor type program it can be manipulated and re-saved but can not be loaded back into the TView program. In other words it can be changed. Once this happens it no longer meets the requirements of US regulation 21 CFR part 11. As long is the data is in an TXV file it is encrypted and complies with the 21 CFR 11 requirements. Can the ThermaViewer be accessed remotely? 1. Once the TV2 data is saved to a computer with the TView program it is just like any other file. If the file’s attributes are set to ‘shared’, or the computer is acting as a server, anyone with access to that computer, either from the local area network or the internet can access it. You must use the TView program on a remote computer to load the chart unless you are loading an exported version of the file with Excel. There is no license or additional fee to install the TView program on more than one computer at a time. Just access it on our web site and download it. Once installed, click on the ‘file’ selection and select ‘load file’. 2. If you need real time data you can click on Current Readings,select the correct TV2 and the sensors to see the current condions and a chart of the last 100 logged readings. Over the Internet using the Port Forwarding feature of your modem. Can I see my logged data in an Excel spreadsheet? When data is downloaded from the TV2 to the TView program it is encrypted so that it complies with 21CFR11. If it is saved it is saved to a code with th .TXV tag which ensures that it can only be opened with the TView program to guarantee that it has not be changed. There is no way to access the data to change it. It can be exported into Excel from the TView program, but once this is done it no longer complies with the 21CFR11 requirements, because the data can now be changed. To get your data into a spreadsheet copy your data from the TV2 to your PC with the TView program and export it to an XLS file. Then you can open the XLS file with Excel a worksheet will be created for each sensor and displayed point by point. Each type of data is listed in a different format. For example, temperature data is listed in °F and °C. If you view the TV2 data as a chart before exporting it into Excel you can use the ‘zoom’ feature of the TView software to highlight the data you are interested in. Please note that you can only export 64k rows of data into a single worksheet of Excel. If you have more than 64K data points only the first 64k will end up in Excel. How much data can I see on the TV2 screen at one time? The TV2 ThermaViewer will store a bit more than 80,000 measurements for each sensor if you are logging temperature only. If you are logging temperature and humidity the TV2 will store 60,000 pairs of temperature and humidity readings. How much time does 80,000 measurements cover? If you are storing data once every 10 minutes, 80,000 data points is more than 1.5 years of samples. You can see either part or all of this data on the screen. How much time your see depends on whether you are zoomed out or not. If you are zoomed out to ‘zoom=10’ you will see all of the measurements ( more than a year and a half of temperature history) on the LCD at one time without paging back and forth. It might be hard to figure out what you are actually seeing, however, with that much data on the screen at once, but you can zoom in until you are looking at as little or as much data as you can interpret. A more in-depth description of how the zoom in and out function works can be found in the appendix of the users guide. How many channels does the TV2 have? The TV2 -202 has four ports for wired sensors. The TV2-201 has four ports for wireless sensors. Each of them can receive data from four sensors, which can be of any type. The TV2 monitor can thus monitor up to four different areas. ; It can monitor three refrigerators and one freezer, for example, or four rooms. Each port has one or two channels depending on the type of sensor being used. If you are monitoring temperature only, each port has one channel. However, if you are monitoring both temperature and humidity, The TV2 monitor receives both temperature and humidity fromone sensor which has two channels. This makes it look like the TV2 is actually using eight sensors. It only appears to be so because the same sensor module monitors both temperature and humidity. It is possible to mix different types of sensors on the same TV2 monitor. You can, for example, have three thermistor temperature sensor and one T-Type thermocouple on the same ThermaViewer, or one thermistor/RH sensor and three thermocouples. You cannot however mix wired and wireless sensors on the same TV2 monitor. If this is confusing, please call and tell us what you need to monitor and we will recommend a configuration for you. Note: The TV2 can be used with several different types of temperature and temperature/RH sensors. A catalog of various sensors can be seen here. Downloading data whether automatically or not is done using the TView software. You can download this free secure software by clicking on the support tab on this page and then on “Software, Users and installation guide”. TView should be downloaded to your computer, unzipped and then installed. Although it is possible to click on ‘setup’ from within the zipped file, it will not install properly. Once the file is unzipped, click on ‘setup’ and accept the defaults. Once installed, link your TV2 monitors to your PC with the ‘Manage TV2s’ menu under ‘Setup’. You will be asked to name the TV2 when it is found. This can be any name you choose. You can then click on ‘Schedule automatic backups’. Specify the file name as well as the location you want to download the data to. We suggest that you create a folder on your computer for the data and, if you have more than one TV2 monitor you should create a subfolder for each one. The file name you specify will be prefixed by the year and the month, (i.e. 2016 03 name) and your data will be seperated into files, one for each month. If you are automatically downloading data, TView sofware will first download all data, seperated into files (one for each month), and then it will continually append data to the open file (for the current month). This only continues while TView is open on your PC, so we suggest you leave TView running and minimize the TView program or put it into your system tray, by selecting that command under the ‘File’ tab. If you exit TView it will pick-up any missed data the next time you open TView. The same procedure must be followed for any TV2 monitors which are plugged into the Local Area Network also. Once you physically plug the TV2 into a network connection (switch, hub, routher, etc) you must assign an IP address to the TV2. Then add the TV2 monitor under the ‘Manage TV2s’ menu under ‘Setup’. TView will then link to the TV2 and add it to its list of TV2s. When you setup TView to autodownload it might take several minutes to download the stored data. TView will first download all the data into files (one for each month) before appending new data to the current month’s file every few minutes. Can I password protect the stored data? The TV2 normally sits out where everyone can see it and examine the data. This is a good thing. The more people who are aware of the environmental conditions the quick any problems will be identified and the more conscious every one is of the importance of controlling the environmental conditions. The display allows anyone with interest in the data to zoom in/out of the data, enter a trace mode, or scroll back to data collected at some previous time. This is desirable, since it makes each person a part of the effort to monitor and control temperature. While you want everyone aware of the data you do not want any one not authorized changing the TV2 parameters. The TV2 has a password system which prevents any unauthorized personnel from entering the menu system and changing the operational parameters. As long as the password system is active, anyone can push any button or look at any data value, but only those with the correct password can change parameters or settings. Even with access to the menu system, the data itself is secure because it can’t be changed, deleted or added to (although it can be erased). The logged data is completely protected and unchangeable. Information on USP <797> and <800>? USP <797> and <800> are General Chapters dealing with non hazardous and hazardous drugs in healthcare, enforceable by regulators and accreditation organizations. Chapters <795> and <797> have been in force for many years. Chapter <800> is being introduced to “help promote patient safety, worker safety, and environmental protection”. This section defines processed intended to minimize the exposure to hazardous drugs in health care settings. Some of the sections of USP <800> as well as <797> and <795> which have to do with environmental concerns are mentioned below. The information listed below is meant only as a general guidelines to the regulations. For more specific information the reader should refer to the regulations themselves. More information can be found here. Any entity handling non-hazardous <795> or hazardous drugs <797> and <800> is currently required to comply with the requirements of USP <797> and <795>. In addition to these requirements USP <800>, is expected to go into effect December 1, 2019 and applies to handling hazardous drugs in healthcare settings. There are a few requirements that impact the physical areas where hazardous drugs are handled. Handled, in the case, means manipulated, packaged, mixed and contacted in any way, whether by hand or an implement. A new requirement of USP <800> has to do with Containment Secondary Engineering Control (C-SEC). In addition to this area having to be externally vented to the outside of the building, it must be maintained at a negative pressure between 0.01 and 0.03 inches of water column relative to all adjacent areas, at all times (24/7). Currently, under USP <797>, a requirement exists for the presence of a pressure guage and at least daily monitoring of that guage. A pressure gauge must monitor the differential pressure between the ante-area and the cleanroom area and also between the buffer area and the ante-area of an IV room. So two different differential pressure gauges are required to be in compliance. There is no requirement for a pressure gauge under USP <795>. TTemperatures should be maintained below 20°C (68°F). Under chapter <797> there is not a requirement for humidity contol or monitoring, although it is generally accepted good practice to maintain Relative Humidity between 35% and 60%. In addition to the USP regulations, the Joint Commission (JCAHO) requires a program for management of proper temperature and relative humidity levels in accordance with Facilities Guideline Institute Guidelines for Design and Construction of Hospitals and outpatient Facilites for all centralized sterile supply storage areas. NNote: JCAHO is continually evaluating the effacy of its requirements and is expected to issue new requirements for humidity monitoring of all storage areas for sterile equipment in the near future. There is a lot of misunderstanding about the internal temperature of refrigerators. 4. Opening and closing the door. wall of the refrigerator about ½ distance between the top and the bottom and midway between the front and the back of the refrigerator. The 2nd sensor was at the back of the refrigerator near the top of the unit. They were only about three feet apart and you would think the temperature in the two area would be the same. But that was and almost never is the case. In this instance there was a 2° to 3° difference in temperature. We suggested that they place the two sensors side by side, even placing a rubber band around them and then look at the temperature. When they did place the two sensors side by side they both showed the same temperature; within 0.5°C of each other. In this case a repairman advised that they purchase a newer sensor. That was not necessary and would have been a waste of money. The problem was not the sensor but the position of the sensor. Why does 2di use digital temperature sensors? Designers of temperature monitors to alarm, log or protect equipment or areas can be built with many different types of temperature sensors. The type of sensor a manufacture of a temperature monitors chooses is usually determined by his best guess as to where the monitor is to be used by the end user as well as his familiarity with the alternatives. If he is building a monitor that will be used to monitor a refrigerator he might choose to use a thermistor because it has a high degree of accuracy over a narrow temperature range. However if he is building a temperature monitor to alarm a cryogenic freezer he will almost certainly choose a thermocouple or an RTD. Choosing a thermocouple instead of an RTD could be based or price since a thermocouple is normally much less expensive than a RTD. Neither an RTD or Thermocouple has good linearity and will require a lot of engineering and additional circuitry in the finished product. The choices of temperature sensors has expended in recent years to provide more choices for the design engineer. For centuries all temperature sensors were analog devices. Analog sensors include the liquid-in-glass thermometers, and bi-metal strip thermometers, which are very low cost, are not extremely accurate and almost impossible to incorporate into multi-purpose instruments. Analog sensors also include thermistors, RTDs and thermocouples, each of which have their pluses and minuses as shown in the table below. Digital sensors are a fairly recent innovation which can be incorporated in many different types of temperature devices such as; temperature monitors, temperature alarms, data loggers and temperature recorders of all types. They have the advantage of providing the best linearity and accuracy as well as being lower cost than the analog alternatives and requiring the least amount of external circuitry. Two Dimensional Instruments offers all the standard analog sensors listed in the chart above but we also offer a digital temperature sensor, which saves the end user money and offers superior accuracy in most cases. Unless you need to monitor, alarm or log extreme temperatures we recommend the digital temperature sensor. The digital sensor also offers increased stability, which translates into longer times between re-calibration. How does a refrigerator maintain its temperature? Here is a great PDF which answers this question fully (with images)! Where can I download my FREE TView Software?